One of the most interesting factory actions on display at SHOT Show was the Thompson/Center Icon. It’s very robust and features multiple lugs on the bottom that mate with a metal bedding platform. Unlike Remington, Sako, or Remington actions, the T/C icon features three integral recoil lugs, CNC-milled bedding block, a large-diameter bolt, and extremely sturdy bottom metal. Click here for a LARGE PHOTO showing all the components of the prototype “Icon” action. Note, production versions may have different magazines. GA Precision will also build a special run of detachable-magazine tactical rifles using the new “Icon” action. CLICK HERE for PAGE with ICON FEATURES. Note: at the top of that page is a flash file. Click on the small red crosses to zoom and highlight particular features. Share the post "Icon Action from Thompson/Center"
We’ve been working the floor of SHOT Show to bring you the latest info and precision shooting products from action, barrel, bullet, optics, and rifle-makers. On a separate page, our daily Shot Shot Reports feature many large photos and video clips with knowledgeable smiths and technicians. Topic Highlights of the SHOT reports will be posted here in the Bulletin. Hornady’s Senior Ballistician discusses new 6.5 Creedmoor Cartridge. 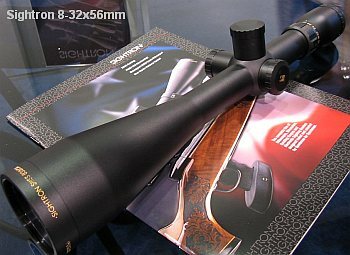 Sightron unveils impressive new 8-32x56mm SIII Target Scope. Glen Harrison, founder of Nesika Bay, reveals production plans (and tech features) of his new line of custom action. Schmidt & Bender showcases much-anticipated 12.5-50 Target scope–and it’s amazing. SKB’s new line of roto-molded heavy-duty rifle transport cases. Chris Hodgdon summarizes new 2008 powder offerings, including Hybrid 100V and Win 780 Supreme. Share the post "SHOT Show Highlights Part Two"